(Nanowerk News) Like spreading a thin layer of butter on toast, Cornell scientists have helped develop a novel process of spreading extremely thin organic transistors, and used synchrotron X-rays to watch how the films crystallize. The experimental breakthrough for studying the structural evolution of organic transistor layers was reported by a joint team of scientists from Cornell High Energy Synchrotron Source (CHESS), including first author and CHESS staff scientist Detlef Smilgies. Other collaborators were from King Abdullah University of Science and Technology (KAUST) and Stanford University. 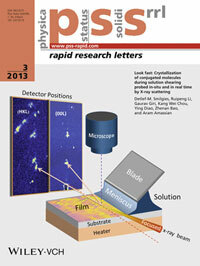 Their paper, "Look fast: Crystallization of conjugated molecules during solution shearing probed in-situ and in real time by X-ray scattering", was featured on the March cover of the journal Physica Status Solidi – Rapid Research Letters. The coating procedure, called solution shearing, is like the buttering of a slice of toast, Smilgies said: The knife and toast need to be well controlled, as well as the speed that the butter is spread. Their actual materials were a solution of a semiconducting molecule called TIPS pentacene, a silicon wafer kept at a specific temperature for the substrate, and the highly polished edge of a second silicon wafer acting as the knife. For use at CHESS beamline D1, Smilgies and Stanford graduate student Gaurav Giri created a miniature version of the full-scale coater developed by the research group of Stanford’s Zhenan Bao. To investigate the drying dynamics of TIPS pentacene under viscoelastic shear, an X-ray beam had to be focused to 20 microns, less than half the width of a human hair, and the time resolution had to be as low as 10 microseconds per frame, to capture the crystallization process. Smilgies used a high-speed X-ray pixel array detector at CHESS, and Giri supplied critical coating parameters. The overall experiment was designed by Smilgies and KAUST postdoctoral associate Ruipeng Li, a former CHESS visiting student. The real-time solution shearing method should be scalable to future industrial roll-to-roll processing of organic electronic materials and provides a deeper understanding of the relevant coating parameters, Smilgies said.